I got at least a dozen good photos tonight - it's always a challenge to pick the ONE that represents the rest! Usually I just post the rest on my other blog, but I won't have much time to shoot in the next few days so I'll probably just draw from tonight's batch for a while. I think you have many good moments there!New England is a very nice area with interesting small villages.I love the winter there. 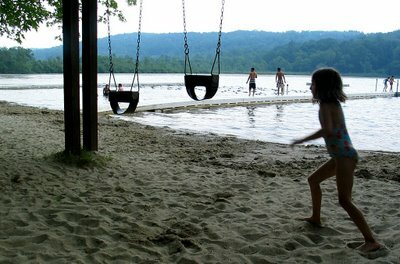 I like the silhouette of the girl and the swings in the forefront of the photo. It creates a nice effect. The area looks like a beautiful place to be, with the hills and trees in the background. Nice shot. I really like the name of the pond for some reason. Mudge pond has a great home town feel to it. That's a lovely photo! And the park looks like fun!